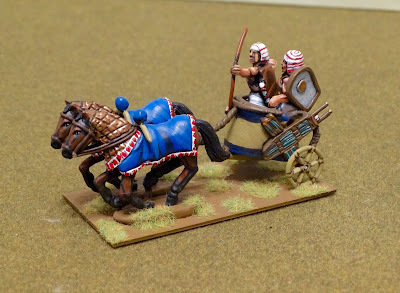 It seems I am unable to shake off my current Ancients Bug - the era continues to fascinate me, as does developing my set of rules for the period. The SYW and WW2 continue to be very much on the back burner. I recently had the great good fortune to meet and game with Roy Boss, current president of the Society of Ancients. 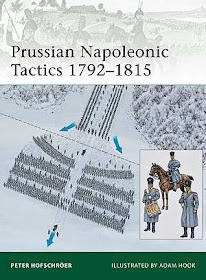 What better contact to make for a budding ancient gamer and rules writer? He lives quite close to me in Cirencester. Roy in his wargames lair. 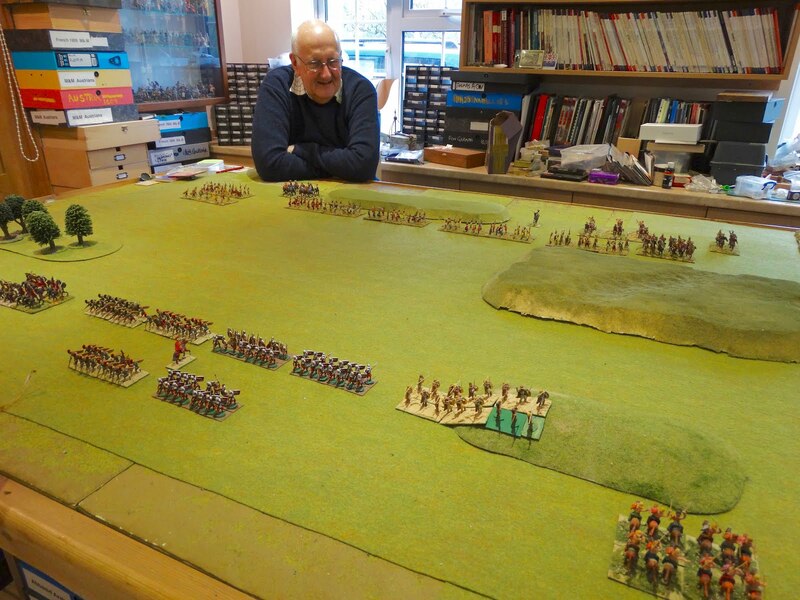 To say Roy's collection of wargames figures is extensive would be rather an understatement - he is a great enthusiast and has 50 years of collecting behind him. 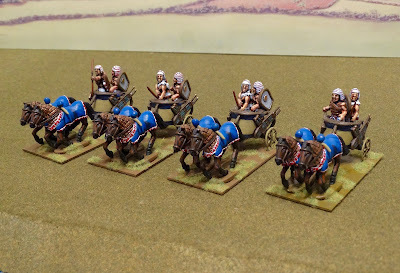 When we decided to have a try-out of my rules with some of Roy's ancients collection, he kindly chose to honour the old school pretensions of the rules with some old school figures. Half an hour or so of delving produced Roman and Celtic armies in 20mm metal, with many of the figures going back to the 60s and 70s. Needless to say, our test game produced much useful discussion and ideas for rule improvements. 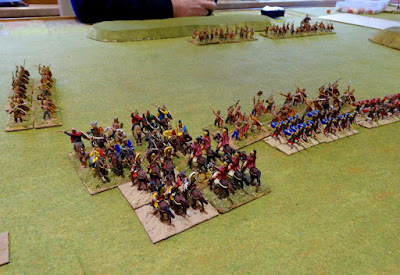 The rules are designed to cope easily with armies based any which way, and Roy's figures were based very differently from my own. 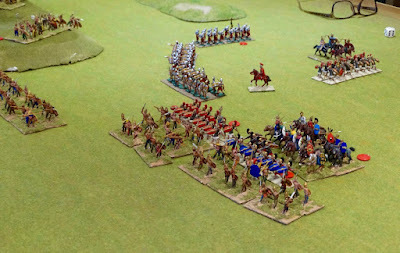 Happily, all went well and I was reassured that basing is not something to worry about. A few more photos are included below. A hugely enjoyable and profitable few hours. Thank you Roy. whilst the legionaries to their right are assaulted by a warband. Oops! How did that happen? Roy is a much better general than I, even with someone else's rules. A much depleted unit of legionaries becomes the meat in a Celtic sandwich. Hmm... this is becoming a habit. 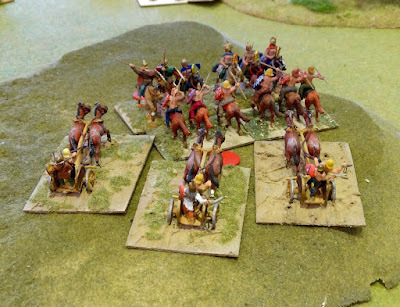 A unit of Roman allied cavalry is surrounded. Overview. I was losing badly when we called it a day. But I had learned a lot. I will be visiting again to have a go at Armati, Roy's favourite ancients set. Playing other rules will add to my knowledge of alternatives and possibilities. 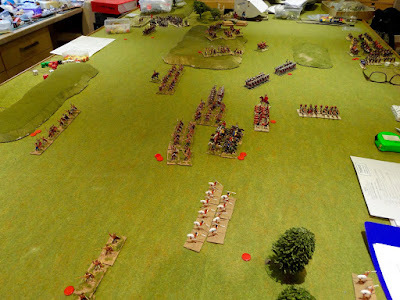 And I have a game of To The Strongest coming up as well, with my longtime wargames buddy and friend Steve J. No sign of the obsession waning just for the moment.